Italy’s famed and varied cuisine is closely linked to each of its 20 regions’ history and topography, and nowhere is this more true (or more varied) than in the largely unsung yet gorgeous region of Abruzzo. 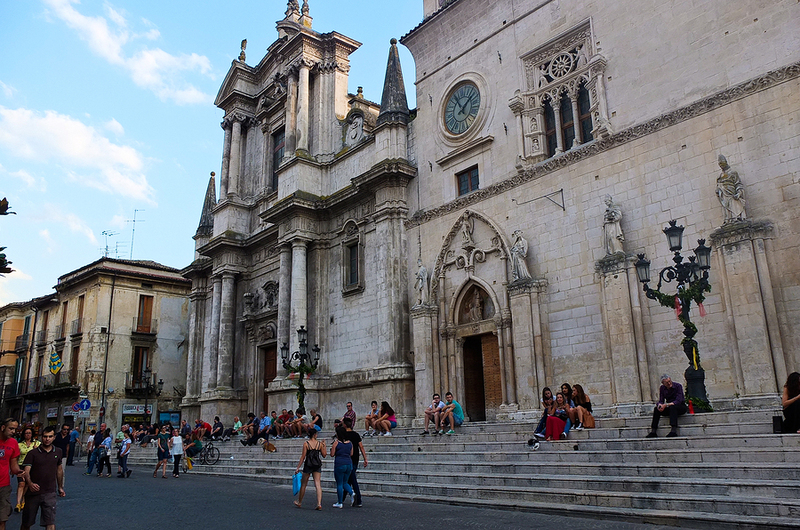 Often overshadowed by Le Marche to the north and Puglia to the south, Abruzzo offers rugged mountains and bucolic beaches that can match—if not surpass—its neighbors, and its position under the tourism radar means that visitors often get the feeling that they have the region all to themselves. Abruzzo’s traditional cuisine matches its diverse topography, featuring local dishes with roots deep in the shepherding Apennine cultures, the agricultural countryside, and the pristine coastline that are so different from each other that they seem to come from worlds away, though they are often separated by just a few kilometers. Pasta: Abruzzo is home to an astonishing number of small gourmet pasta producers, who take advantage of the region’s quality durum wheat production and crystalline spring water to turn out some of the highest quality pasta in Italy. The cradle of its production is at the foot of Mount Majella in Fara San Martino, where artisan producers large and small combine excellent local ingredients, long-honed skills, and historic bronze dies to continue their long and proud pasta-making tradition today. 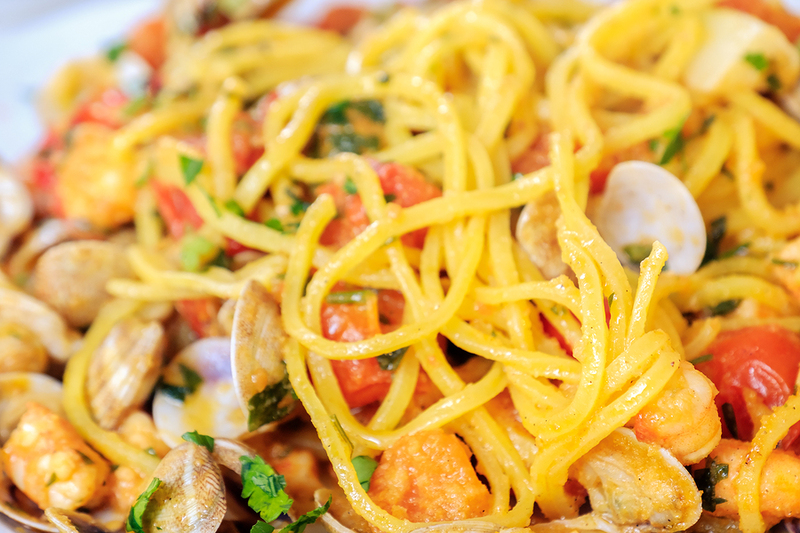 One of the most common pastas found throughout the region is Maccheroni alla Chitarra. This long pasta is cut with a chitarra (guitar), a wooden instrument strung with wire that turns out long spaghetti-like noodles that are square rather than round in cross-section and commonly served with a tomato sauce and topped with pallottine (tiny veal meatballs). Another regional specialty is ceppe, an egg pasta made by rolling lengths of dough around a thin knitting needle to form long, hollow noodles served with meat ragù and a dusting of local pecorino sheep cheese. Cheese: Speaking of pecorino, the steep mountainsides of Grand Sasso have been home to large flocks of sheep for hundreds (if not thousands!) 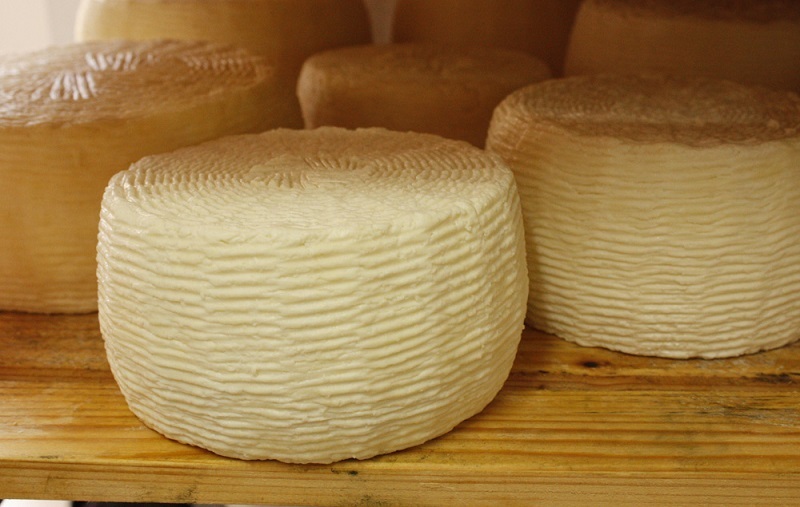 of years, and some of the tastiest sheep-milk cheeses in the country are made by the small producers below these peaks. Especially tasty are the Canestrato di Castel del Monte, a pecorino aged for two to twenty-four months in fuscelle wicker baskets, giving it a uniquely recognizable surface pattern, and Pecorino di Farindola, which is made with a specific type of rennet and, during the ripening process, turned, massaged, and bathed with extra virgin olive oil and vinegar...all by hand. Meat: Abruzzo’s flocks of sheep are raised not only for milk, but also for meat. 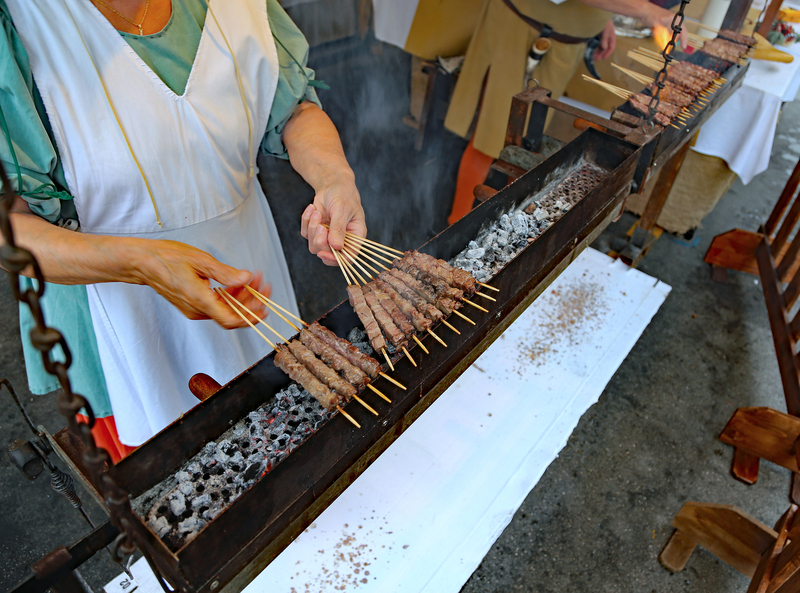 Meat dishes in this region are heavy on lamb and mutton, and perhaps one of the most famous foods of Abruzzo are arrosticini, found from the highest mountain villages to the seaside towns. These bite-sized cuts of mutton, skewered on thin kebabs and roasted, are the great social equalizer...meant to be eaten by hand straight off the coals. Abruzzo also produces a variety of excellent cured meats, most made with the pork raised in the hill country between the mountains and the sea. Look for guanciale amatriciano (lard marbled with lean meat cut in a triangular shape from pork jowl and cured with salt and pepper and smoked), and spicy hard Ventricina del Vastese or spreadable fennel and chili laced Ventricina Teramana sausages. One the shores of Campotosto, Europe’s biggest artifical lake, visitors can sample one of Abruzzo’s most delicious cured meats: Mortadella di Campostosto. Made with lean pork formed in an oval around a lard core, these hard sausages are then hung to dry in pairs and briefly smoked. Aged from three months to a year, this charcuterie is hard to find outside the region and worth searching out. Fish: Below its towering peaks, Abruzzo’s long coastline stretches for kilometers along the Mediterranean, where there has long been a rich tradition of fish and seafood dishes. The most beloved among locals is Brodetto di Pesce, traditionally a “poor man’s” tomato chowder made from the motley assortment of fish and seafood leftover from each fisherman’s morning catch. Now considered a regional delicacy, the recipe varies from town to town along the coast-- you can sample Brodetto alla Giuliese, Brodetto alla Pescarese, or Brodetto alla Vastese depending upon where you are served up a bowl—but expect to find an assortment of scampi, cod, mullet, sole, dogfish, and skate. Also try Abruzzo’s tiny local clams known as telline, tossed with pasta, and whole baby cuttlefish, lightly fried and mounded on a plate. Sweets: Abruzzo is famous for two regional sweets that have long histories. Confetti di Sulmona (sugared almonds) have been made in this town since the 15th century, and the whole nuts coated with a layer of pure white sugar from a series of dippings and then colored and arranged like bunches of grapes, ears of wheat, flowers, baskets, and a number of other creative shapes are still sought after by couples celebrating weddings, Christenings, and anniversaries across Italy five hundred years later. The centuries-old confectionary history behind this town’s famous sugared almonds is told in the Pelino factory museum, where visitors can learn about the evolution of its production, techniques, antique machinery, and vintage posters and packaging. More recent—but no less beloved—is Torrone Tenero Aquilano, a soft chocolate nougat made by adding cocoa powder to the traditional ingredients of nuts, honey, and egg whites. Made by a handful of artisans around Aquila, this traditional sweet is especially popular at Christmas.